Riley LaChance carved me up in high school. Now he’s fourth in the nation in 3P%. Whether you realize it or not, college basketball is in the middle of a massive evolution phase. The analytics trickle-down effect is very real, and this can be emphatically seen actualized in the numbers. The following graphs display national average figures in college basketball since the 2001-02 season. On the left we can see the variation in the national 3-point attempt rate (percentage of field goal attempts that are threes) and the national 3-point percentage over this span, with the black vertical line indicating the NCAA’s movement of the 3-point line back a foot to 20’9” prior to the 2008-09 season. The move was in response to a rapid rise in marksmanship from deep, and seriously, it was about damn time. My 6th grade Waukesha West Junior Wolverines team made 15 threes in a game once. You’re telling me J.J. Redick was getting the credit and accolades for the same distance shot? Absurd. After an initial decline in attempts and percentage in the 2008-09 season, there has been a general upward trend from beyond the arc since. Said trend is much more pronounced beginning with the 2013-14 season, highlighted by a meteoric linear rise that is continuing this year. Teams are taking more, and making more. If the season ended today, we would bear witness to the highest national 3-point percentage since the line was moved back. This inclination is, yes, rooted in analytics, but those analytics are also rooted in logic. With college players now connecting on 34.8% of the attempts from deep, the three is a better, more efficient use of a possession than a two (national average always less than 50%). Now, we have the major explanation for the recent spike in adjusted offensive efficiency in the graph on the right, with the last four seasons (including this year) dwarfing the remainder of the KenPom era. So, as Jay Bilas endlessly complains about the state of the game, the truth is that shooting has never been better than it is at the moment, and the same goes for the product on the floor. Enjoy it. Showtime has returned to Westwood in 2016-17, and it appears the Pac-12 may be primed to end a nine-year Final Four drought thanks to the Bruins, with the Final Four this year, fittingly, taking place in Phoenix. Entering the year, the general consensus was that Lonzo Ball and his giftedness moving Bryce Alford off the ball would vastly improve UCLA offensively. However, it would have been difficult to forecast this type of offensive exhibition the Bruins have treated us to on a nightly basis. UCLA’s astronomical effective field goal percentage currently sits at 63.3%, the nation’s best, and barring an unforeseen significant injury, UCLA will be the second team ever to eclipse 60%, with the other being the 2004-05 Samford Bulldogs. The Bruins also find themselves in the top 5 nationally in two-point % and three-point %, which has only been previously accomplished three times (’05 Samford, ’13 Creighton, ’14 Creighton). Obviously, everything begins with Ball and the tempo he sets. The constant pressure Ball places on opponents with either pushes off of both misses and makes or with pinpoint lead passes is a primary reason why the Bruins have become indefensible. Ball and Alford both owning accurate in-the-gym range stretches the defense beyond repair, opening up gaping driving lanes for all. These driving lanes truly reveal that UCLA occupies every area of the floor with scoring, making describing them as a “juggernaut” kind of an understatement. Keying in on and overplaying Ball and Alford create uninterrupted rack-attacks, drive-and-kick opportunities, and the forgotten short corner where the clinical Thomas Welsh operates. Welsh and freshman T.J. Leaf are deadly from 15 feet, with Leaf also peppering the Bruins’ non-conference foes with trail threes, as well. We haven’t even mentioned the Bruins two highest-usage players in Isaac Hamilton and Aaron Holiday, the latter improving immensely from his freshman campaign and shooting over 50% from both two and three on the year. The majority of college basketball teams, at some point or another, will inevitably have to fend off a drought thanks to the adjustments of conference opponents. With UCLA, however, I have yet to figure out a way in which they may potentially be slowed down, as simply too many weapons grace the Pauley Pavilion floor. UCLA can only beat themselves on the offensive end. Duke? Yeah, they’re the nation’s best. Don’t overthink it. That said, UCLA on the defensive end can, at times, be quite permissive. Overall, while the gap is far smaller than I had anticipated heading into the season, Duke, sitting at #5 in the AP Poll and may be trapped there for some time, is still the best team in the country. Yes, cases can be made for Villanova, for UCLA, for Kentucky. No one, conversely, can be found in the green (the nation’s top 50%) in all of KenPom’s Four Factors and miscellaneous component categories, except for Duke, whether you like it or not. It’s well-documented the Blue Devils have not been healthy. Their lone blemish was to Kansas at the buzzer while essentially playing five guys. Then Tatum returned, and started hitting Dirk fadeaways as the Blue Devils dismantled a very good Florida defense. Harry Giles is being eased in. And just as Coach K finally had his full complement of players at his disposal, Grayson Allen forgot how old he was and became the epicenter of the meme universe for a couple of days. One of the most embarrassing meltdowns I have ever seen has not deterred me from the fact that Allen, himself, has not been healthy physically this year, leading to the reduction in his efficiency. This suspension is an opportunity for him get right more importantly mentally, but also physically. It’s not an exaggeration to say Duke’s entire season hinges on what type of Grayson Allen we see emerge from his timeout corner. He’s critical to the point guard-by-committee the Blue Devils been forced to take, one that may actually end up being a positive for them. The pieces never left. Durham fuses oozing talent, versatility, youth, and experience like nothing we have seen since the 2011-12 Kentucky Wildcats, while Luke Kennard is the one playing at a Player of the Year level. As Bob Huggins and the Mountaineers continued to pile up resume wins last year, the elephant in the room persisted. “Press Virginia” developed itself into a legitimate brand, but not a brand that was suited for March success. West Virginia fouled more than anyone in the nation last year, amassing a dreadful 55.3 defensive free throw rate, good for dead last. The Mountaineers, additionally, could not throw the ball into the ocean most times (32.5% from 3, 268th in the country), getting by for three months on turnover creation and the offensive glass alone. Their success, simply put, was not at all sustainable, evidenced by getting buried by 14-seed Stephen F. Austin in the opening round of the NCAA Tournament. This go-round, however, appears to be a much different story, one that will likely provide happier endings. As the turnover creation (1st) and offensive rebounding (4th) have remained constants, WVU’s deficiencies have been addressed. They are fouling A LOT less, cutting their defensive free throw rate to 37.0 in 2016-17, permitting less freebies for opponents. More decisively, the Mountaineers are actually hitting shots. The nation’s 46th-best effective field goal percentage is attributable to the enhancement of the jumpers of the likes of Daxter Miles, Jr., and the addition of Teyvon Myers and James Bolden to Huggins’ 70-man rotation. Hidden in Huggins’ annual cupcake non-conference schedule is a win against the Cavaliers in Charlottesville, a marquee win that can now be taken more seriously given the Mountaineers are not quite as helter-skelter. These changes will make all the difference in the world for West Virginia, who I assure will not bow out on the opening Thursday/Friday again. On back-to-back possessions in the first half last Wednesday night against Louisville, Kentucky responded to Cardinal made baskets with a De’Aaron Fox lead pass and Bam Adebayo dunk, each requiring approximately three seconds to complete. Those two possessions epitomized Kentucky’s identity this season. Traditionally under John Calipari, the Wildcats’ pace has been a far cry from what we’ve witnessed this year, generally in the middle of the pack nationally or playing at a pace slower than average. The lone season that approaches this year is Calipari’s first, in which he understandably had John Wall running the show. Tempo always begins with the lead guard, and De’Aaron Fox has speed that matches, and may even surpass, Wall’s. Calipari’s willingness to cut Fox loose has shielded his team from having to play in the half-court, not exposing their poor 3-point shooting (outside of Malik Monk) just yet, a demon they will more than likely have to exorcize as conference play arrives. Monk’s fluorescent green light contributes to the pace uptick, as well. His ability to make contested shots from any platform was on full display in his dazzling performance against North Carolina. Calipari has not had a backcourt this dynamic since the Wall/Eric Bledsoe duo, and he has molded his philosophy to his personnel very well. If Kentucky remains in the open floor for 40 minutes, only few can keep pace. Something is noticeably omitted from Oregon’s half-court offense. Dana Altman and the Ducks are sorely missing their small-ball methodology and the versatility of Elgin Cook. En route to a 1-seed last season, Oregon ran pretty offense, initiating their sets out of the high post with Cook or Dillon Brooks, who, in turn, consistently attacked mismatches. The departure of Cook has plunged the Ducks into employing mostly a lineup with two bigs in Chris Boucher and Jordan Bell. While Boucher is able to space the floor, the minimized skill is detrimentally harming Altman’s team. Instead of those high-post sets with off-ball movement and several counters, Oregon this season offensively is not imaginative at all. Possessions oftentimes bog down quickly, calling for a simple high PnR. The lack of movement has forced Brooks, Dylan Ennis, and Tyler Dorsey into countless iso situations, with only Dorsey having a whiff of success. Furthermore, defenses have not been inclined to honor Payton Pritchard and Casey Benson’s shooting (19-67 from 3 combined) out of those pick-and-rolls, and neither of whom are players that like to turn the corner off screens and attack. Altman has seen his team plummet from 13th offensively in 2015-16 to 48th this year, with that rank continuing to drop even with Brooks’ increasing health. If it wasn’t clear already, it’s time to pump the brakes on the Ducks’ sky high preseason expectations, as this is an issue that will take some time amend. The sour taste of the Arkansas-Little Rock collapse of last March appears to have fueled the Boilermakers to an 11-2 start and the makings of a Big Ten title contender. Perhaps what Caleb Swanigan and Co. enjoy more is their under-the-radar status in the national title conversation as much of the scuttlebutt focuses on the bluebloods. One of the first qualities of a team to look for in title contenders is the ability to win in a variety of ways, as six wins is necessary to cut down the nets. Contrary to last season, Purdue in fact possesses that capability. We saw that present itself two Saturday’s ago in the Crossroads Classic against Notre Dame. Matt Painter strayed from a customary bruiser approach to combat Notre Dame’s small ball, utilizing Vince Edwards and his greatly improved jumper at the four and delegating Isaac Haas to the bench for nearly the entire second half. The Boilermakers, resultantly, impressively dug themselves out of a 14-point halftime deficit in transit to an 86-81 victory, beating the Irish at their own game. Moreover, Purdue can beat you from anywhere. Their downscreen/hi-lo action with Swanigan and Haas are an absolute pain to cover, especially with the Boilermakers’ roster now filled with knockdown shooters (9th in 3-point %). Purdue can really share the sugar, ranking 3rd nationally in assist rate, and Caleb Swanigan is at last fully playing to his strengths on the interior while raising his 3-point percentage in the process. The Boilermakers make their mark on the other end of the floor with a Wisconsin-esque ability to defend without fouling and clean the glass. Yet, due to a near miss at home against Nova and a road loss at Louisville, Purdue is only lurking in the shadows at this stage. The Gators have confusingly been a metrics darling the past couple years, but the fondness of the numbers this year is more warranted. The point guard position remains a question mark as the same shot selection and turnover issues that haunted Kasey Hill as a freshman linger. Beyond that, nevertheless, Florida checks all the boxes. 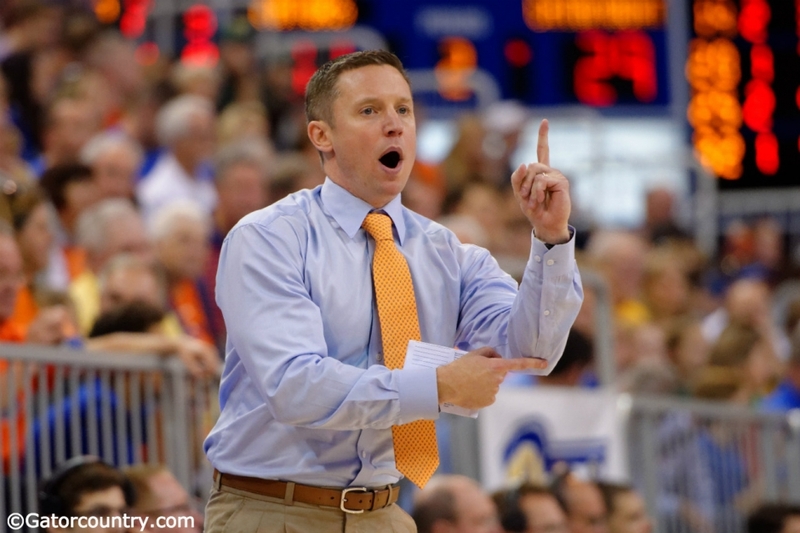 Mike White has orchestrated one of the most undervalued defensive teams in the country. The story regarding Devin Robinson has been his emergence offensively, but his length is causing serious problems for the opponents’ best player every night out, and John Egbunu continues to develop into one of the nation’s most imposing rim protectors. On the other end, the Gators have a genuine shotmaker in KeVaughn Allen and one of the most undervalued stretch fours in the country in Justin Leon. The hindrance, in the end, will be Hill’s and Chris Chiozza’s turnover propensities. If that can be miraculously revised, the Gators are a sneaky Elite Eight-worthy squad. In our Top 25 countdown, Mike warned you about his alma mater. This year is finally the year. The Wildcats presently are one of Joe Lunardi’s Last Four In. A neutral court win over the Dayton Flyers went a long way towards Northwestern breaking the seal. It will be imperative for Northwestern in Big Ten play to avoid the awful loss that has plagued them in the past, and have a winning record against fellow Big Ten bubble teams such as Michigan State, Illinois, Maryland, Ohio State, etc. The skinny: Northwestern is actually pretty darn good, and could very easily be 13-0, if not for Kamar Baldwin’s audacity and Nathan Taphorn’s Nathan Taphornness. Bruce Weber put together a very underwhelming non-conference slate this season, but that has kept the Wildcat secret under wraps. Kansas State’s big bugaboo last year, in spite of a victory over Buddy Hield and a near upset of North Carolina, was putting the ball in the basket. Kansas State may actually be the single most-improved shooting team in the country this year, connecting on 38.8% (48th) of three-point attempts in comparison to a meager 30% (335th) last year. It has been a collective effort, as Dean Wade, Kamau Stokes, and Barry Brown have all made enormous strides, and the addition of nationally-underrated freshman Xavier Sneed has been integral. The Wildcats are yet another team that should be undefeated at the moment, suffering their only loss to Maryland as a result of a phantom foul call. Clemson, among others, was one of the preseason KenPom surprises, landing in the top 25. The Tigers, however, have not faltered, still finding themselves in the KenPom top 25, and for good reason. Vandy transfer Shelton Mitchell has solidified the floor general role. The Tigers are, in fact, undefeated since his return, as senior leader Jaron Blossomgame seeks to take this program to the NCAA Tournament for this first time since 2011. A short bench grew even shorter with freshman Harry Froling’s decision to transfer from the program. The Mustangs, though, remain one of my preseason sleepers and seem to be hitting their stride. Their breakout performance last week at home against Stanford in which they erupted to a 31-point lead and coasted to a 72-49 throttling of the Cardinal is the type of game we can expect from Tim Jankovich’s team moving forward. The enhanced leeway from the perimeter with Larry Brown away is working to the Mustangs’ advantage. The next challenge will be accumulating some more quality wins, which will be difficult to come by in the AAC. Last Spring, I wrote about the Law of Large Numbers governing Villanova’s stellar NCAA Tournament run. On a much smaller scale, we have another case with the Belmont Bruins. A program built on outside shooting is not even remotely close to their standards this year, shooting 30.5% from deep, with several of their players’ percentages not reflective of the shooters they are. The ultimate example is Taylor Barnette, a sharpshooter enduring a brutal season-long slump (24% from 3). We’ve been waiting for the Bruins’ bust-out game, and it looks like that came Thursday against Cleveland State. Belmont canned 14 of 30 threes and erupted for 88 points. Percentages always converge to the mean, so don’t be surprised if they run the table in the Ohio Valley. Oh, the Terrapins, the perpetual sweethearts of that whole thing called “luck.” If you thought luck was not quantifiable, let me introduce you to KenPom’s Luck Rating. The metric is complicated, but long story short, it is a numerical value that factors in results in close games as well as opponents performing uncharacteristic to their percentages, especially free throw percentage. Two seasons ago, Maryland ranked as the second-“luckiest” team in college basketball, and currently sit at #7 this year, which is understandable given one-point victories over Kansas State, Oklahoma State, and Georgetown, with the latter being a game they had no business winning. Anthony Cowan moving Melo Trimble into a primarily scoring role certainly helps, but among the cluster in the center of the Big Ten, I feel Maryland is outmatched and will fizzle out at some point. Luck has to catch up with you, and the Terrapins don’t have much talent to write home about. College’s most hysterical brand of basketball can be found in the Southern Conference. Duggar Baucom solidified his patented run-and-gun system at fellow military institute VMI, and some years he made it work. When he took the job at The Citadel, the transformation was immediate. The Bulldogs rose from 343rd in tempo in 2014-15 to 1st last season by a landslide, all stemming from Baucom’s system. The manner in which The Citadel plays is the closest thing we will ever see to cherry-picking basketball at the Division I level. The Citadel’s average offensive possession takes 13.3 seconds (2nd fastest). More telling, however, is their average defensive possession takes 14.9 seconds, also 2nd fastest in the nation, leading to the nation’s second-worst defense. Essentially, Baucom encourages his players to employ matador defense in solely an effort to get the ball back and hoist up a terrible three as rapidly as possible, as nearly 50% of their field goal attempts are threes. Whatever the antithesis of quality is, that’s what we have here with The Citadel, but they have me reeled in. The Bulldogs may not be everyone’s favorite comedy, but at least they’re mine. It is at least somewhat entertaining to track The Citadel’s shot distribution, and their system is certainly catered to putting up triple digits on several occasions. In regard to the SWAC and MEAC, however, I have consistently seen more aesthetically-pleasing basketball played at the SERF. This is old news, as the SWAC and the MEAC are regularly the nation’s bottom-feeders, but the atrocity seems to have reached an entirely new level this season. 18 of the bottom 35 teams in Division I college basketball call these two conferences home, with those 18 teams amassing just 36 wins total. Yikes. I will try and keep this as compact as possible, but understand that’s a tall task. Can’t lie, I had a fair amount of concern this November. Seven consecutive made threes at Creighton proved to be fool’s gold as the Badgers chose to die by the three. 39 of 63 (62%) of field goal attempts that night were from beyond the arc against a man-to-man defense. Paint touches were never even thought to be explored. The troublesome shot distribution was an early season trend, leading to the lowly nights like the ones we saw in Omaha and later in Maui. The change was initiated a week after the drubbing at the hands of the Tar Heels with an individual performance that had Josh Gasser rolling over in his sleep. As Nigel Hayes fell a free throw shy of a triple-double, the Badgers unlocked the team they set out to be. Hayes put his court savvy on full display in about as clinical dismemberment of a 2-3 zone you’ll see. From that point forward, Wisconsin has smartly initiated their offense out of the low post, a necessity for a team with a point guard like Bronson Koenig. A team that can effectively invert their offense as Wisconsin has done immediately has a leg up. It’s no accident Hayes and Ethan Happ are the Badgers’ leading assist men. The two exude patience and read double teams and weak side help like few others in the college game right now. Not coincidentally, the quality of three-point looks has increased, as have the percentages. As for the three, the “automatic” exclamation in Travis Scott’s “Outside” was actually in reference to D’Mitrik Trice from beyond the arc, we just didn’t know it until now. I’m shocked it is not yet played over the Kohl Center loudspeakers as the freshman rises up for a three from the right corner pocket. Trice’s emergence and his 18-30 from deep has been imperative, as Wisconsin’s shooting off the bench previously was nothing to write home about. He’s provided another much-need kickout outlet for Hayes and Happ and shown the ability to hit shots off the bounce. Speaking of Happ, the expansion of his game we were expecting entering the year was the addition of a short jumper. He did, in fact, give us a taste with his first career field gold make outside of the paint (!!!) against Green Bay. Largely, though, Happ is the same player as he was as a redshirt freshman. It’d be difficult to expand that portion of your game, but Happ’s already exquisite footwork and patience actually got better, and so did his touch around the basket. Above all, Happ’s understanding of attacking double teams and reading defenses is what took the largest leap forward, which is deadly when combined with his dexterity and array of moves and fakes. At the end of the day, though, Nigel Hayes decides how far this Wisconsin team goes, and the Hayes we’ve seen over the past month is the one we should expect moving forward. When operating in the appropriate areas of the floor, Hayes holds the keys to yet another Final Four team, and that fact has appeared to settle in with him over this 7-game winning streak. Confidently the Bears are not the fourth-best team in college basketball as the AP Poll indicates, but Baylor has wildly exceeded expectations. Emerging as winners of the Battle 4 Atlantis, dismantling the Xavier Musketeers, and embarrassing the Oregon Ducks, Baylor has clearly made a statement in November and December and should be the supreme challenger to Kansas in the Big 12. The true difference maker for Scott Drew’s team in 2016-17 has been a Boeheim-like 2-3 zone. Drew has a similar personnel makeup to his past teams, oozing length. Baylor’s top 20 defense this season, however, is unlike their recent teams who saw their zone be pulled to pieces at times. Now, sometimes I have found myself watching the Bears and wondering how the opponent can even score at some point. The baseline is completely swarmed and shut down at each instance, and the Bears close on shooters as quickly as you’ll see out of a 2-3 zone. It also helps to have the ultimate security blanket in top JUCO transfer Jo Lual-Acuil, the nation’s best shot blocker. Richard Pitino is finally earning his paycheck. After a dreadful 2015-16 where he completed the season with 7 capable eligible players, the Gophers have cascaded to a 12-1 start, already surpassing last season’s win total. Pitino, simply put, has done one of the best jobs in the country this year, but Amir Coffey, Eric Curry, Reggie Lynch, and Akeem Springs were not at his disposal last year. Pitino had the talent to pilot NCAA Tournament teams in each of his first two seasons at Minnesota, but each faltered. The talent is there again, but Pitino seems to have learned from the trials and tribulations of his first three years. The youngest team he’s had is in position to send him the Dance for the first time. Toiling at my desk cramming for an applied linear algebra final, the proverbial last straw for Syracuse materialized on my cellular device. St. John’s 93, Syracuse 60. At the Carrier Dome. At the same time, Wiz Khalifa was imploring me to “Wake Up,” so surely I couldn’t believe what I was seeing. But no. The Johnnies mutilated what Jim Boeheim called his “best team” back in August. Jim Boeheim’s best team went ice cold in Brooklyn against South Carolina. Jim Boeheim’s best team lost to UConn, who lost to Wagner and Northeastern and snuck by Loyola Marymount and Boston U, if you’re into the whole transitive property thing. It was one of the most perplexing results I’ve seen, one that cannot really be explained. So yes, Syracuse, more than anyone, belongs here. Wayne Tinkle’s second season in Corvallis has been…well……let’s take a look. His son, Tres, the Beavers’ best player, has only played in 6 games due to injury issues, but Tinkle you’d figure still has enough talent to field a relatively competitive basketball team with Drew Eubanks, Stephen Thompson Jr., and JaQuori McLaughlin, among others. Then you look at the results, and see a lot of red. The Beavers have plunged from 81st in the preseason to 206th, by far the worst drop in college basketball this year. They’re 4-9, and the losses? They’re really bad, bottoming out with an overtime slip-up against 338th-ranked Savannah State at home. I don’t see Gary Payton walking through that door. Hence, it’s fair to say Oregon State will compete with Boston College for worst power conference team after reaching the NCAA Tournament for the first time since 1990 last year. Yes, the Blue Raiders are coming off back-to-back losses, including one at home to #RonHuntersBoys. Nonetheless, Kermit Davis actually has a squad that is significantly better than the team that knocked off Denzel Valentine and Michigan State in the biggest upset in NCAA Tournament history. Giddy Potts is the best shooter no one knows about, and Arkansas transfer JaCorey Williams has been dominant on the interior as expected. The Blue Raiders caught lightning in a bottle against the Spartans last March. Now, with the ability of Williams to complement MTSU’s threats from beyond the arc, they become far more difficult to defend. Middle Tennessee has made mincemeat of the SEC, beating Vanderbilt and Ole Miss by a combined 38 points on the road, and have a nice neutral court win over a good UNC-Wilmington team, which accounts for the Seahawks’ only loss. John Konchar is the captain, coach, general manager, and owner of the All-Unsung Team. The sophomore redefines the term “unheralded,” as the only scholarship out of high school in West Chicago for the 2-star recruit was from the Mastadons. Since, Konchar has quickly ascended to quintessential glue-guy status. His invaluable presence on the court is evident in his minutes, which ranks 53rd nationally. Konchar fits the cliché of doing all the little things, but he does so while being outstandingly efficient. Listed as a 6-5 guard, but essentially the power forward in most of IPFW’s lineups, Konchar shoots 70% from the floor, and for this reason, averages 14.2 points nightly while being a low-usage player (16.3%). This has always caught my eye in peeping box scores, but I was able to see Konchar and the Mastadons in action for the very first time in their monumental upset of the Hoosiers just before Thanksgiving this year. Konchar confirmed everything I had previously believed he was and then some. Oh yeah, and he threw down an off-hand absolute hammer on Juwan Morgan, Thomas Bryant, and just about the entire state of Indiana. Jon Coffman stuck Konchar in the middle of Indiana’s 2-3 zone the entire night, who ripped them to shreds with hot-potato touch passes out to open three-point shooters. At that point, the legend of John Konchar was born, and I frankly feel sorry for the 3-seed that has to run into the Mastadons in March. A rogue Butler freshman in the first half anticipated and deflected a post-feed, leading to a Northwestern turnover, and immediately on the other end and rose up for a jab-step three. OH HE’S LEFT-HANDED. Bang. Pure. That instant, I knew. Whoever this kid was, he would surely become one of my favorites and terrorize the Big East for four years. As destiny had it, Kamar Baldwin capped the game this way. Avert your eyes, Mike. The first month of Baldwin’s freshman season has had its fair share of ups and downs, especially in the turnover department, but the aforementioned steal has been the freshman’s bread and butter. He ranks 8th nationally in steal rate at 5.3%, astonishing instincts for a first year player. Baldwin is perhaps even more fearless on the offensive end and might be the Bulldogs’ best shot creator. On the whole, Baldwin is a critical piece for one of the bigger surprises of this young college basketball season. Many felt the Trojans would be hard-pressed to duplicate their NCAA Tournament appearance of last season with the surprising departures of Nikola Jovanovic and Julian Jacobs to the professional ranks. But hey, conference play is here and USC is one of six remaining undefeateds. The Trojans’ unanticipatedly stellar freshman crop is the driver behind this start, and the head of the class is Melton. On a per 40 minute basis, Melton is stuffing the stat sheet with 14.7 points, 8.6 boards, 5.1 assists, 2.7 steals, and 1.7 blocks on 52% shooting. The Swiss Army knife has been thrust into more minutes with the injury to Bennie Boatwright, but the production and efficiency has not wavered to a point that Melton is now garnering attention from NBA scouts. By now, you may be aware that Marcus Keene is the nation’s most prolific scorer at over 30 points per game, something that hasn’t been accomplished in college basketball for 20 years. What is not gathering enough attention is how Keene is making this possible. It’s obvious Keene is a high-usage player. Even while Keene uses a flabbergasting 36% of the Chippewas’ possessions, he is shooting over 50% from the field and 42% from beyond. In order to prolong that 30 ppg checkpoint, Keene will have to maintain this type of efficiency. Either way, the diminutive scoring guard should have eyes flocking to ESPN3 for a taste of #MACtion, and who can blame them after he hit the most casual dagger 3 in the history of basketball? As tradition dictates, I made the effort to be in front of a screen watching college basketball all day on the season’s opening Friday, which means I was obliged to watch Miami Ohio battle a Division II team. It proved to be a blessing in disguise, as I was able to discover Weathers, a freshman with a twin brother on the team as well. The immediate standout was Weathers’ floater game, which is very reminiscent of Isaiah Taylor’s. I have not had the opportunity to watch the Redhawks since, but Weathers is putting together a very intriguing season. He attempts 19th-highest volume of shots of anyone in the country, while simultaneously owning the nation’s 4th-best assist rate at 47%. In essence, Weathers has the ball in his hands virtually all the time, charged with the duty of creating effectively all of the offense for John Cooper’s team. He has handled it masterfully, and if it wasn’t for Marcus Keene, Weathers would be the runaway winner of MAC Newcomer of the Year honors. More affectionately known by OOWF as the Energizer Bunny, Skelly has enjoyed an unscrupulously terrific season as an energy guy for the much-improved Wildcats. Whenever Skelly saw the floor in his first two seasons in Evanston, he appeared to be overmatched, with opponents making a point of emphasis of attacking him. The Bunny in 2016-17 has made a complete 180, shockingly becoming one of the feared shot blockers in the Big Ten, giving Northwestern menacing rim protection when he is paired with sophomore Dererk Pardon. Cleaning up the scraps on the offensive glass, additionally, has led to a 131.2 O-Rating, good for 47th in the country, with an honorable 3-point jumper. Landale clearly put in the work when no one was looking this offseason, as Randy Bennett has milked another gem out of his Australian pipeline. Landale has gone from first big off the bench last year to the WCC Player of the Year frontrunner and legitimate All-American candidate. An old-school, back-to-the-basket game is refreshing to see, and Landale has been a load for opponents to handle thus far. All in all, he hardly misses and dominates the glass after playing just 36.4% of available minutes last season. He has supplanted both Evan Fitzner and Dane Pineau on the totem pole due to his willingness to pass out of double teams being a perfect fit for the Gaels’ personnel. St. Mary’s would not be where they are sans Landale’s rise. If there could be a singular most improved player in college basketball, Farrell is the man. The insertion of him into the starting lineup last season as a game manager brushing Demetrius Jackson off the ball was a contributor to the Irish’s strong finish. Farrell, this season, has done far more than manage games. He has taken over games on multiple occasions with his uncanny vision and PnR navigation, proving you need not be able to see over the defense to be able to see the whole floor. His per 40 numbers have surged from 7.8 points, 2.4 rebounds, and 4.8 assists on 37/32/88 to 17.7 points, 2.6 rebounds, and 7.7 assists on 46/38/100. Mo Wagner’s improvement is more of a case of him fulfilling his ceiling, because the tools were indisputably there. The German 7-footer in the matter of a year has gone from little used 4th big to a starting center and critical piece to the Wolverines’ attack. He is, as a matter of fact, Michigan’s highest-usage player, consuming 24% of possessions compared to just 17.6% in 2015-16. Above all, Wagner’s confidence facing the basket and in pick-and-pop situation is sky high in comparison to where he sat a year ago. At 15-30 from 3 compared to 2-11 last season, Wagner makes the Wolverines almost unfeasible to defend when clicking. The usual transition for transfers in college basketball involves an inverse relationship between level of competition and production, and a positive correlation between level of comp and efficiency. Bartley transferred to a lower level of competition after two seasons at BYU. We’ve seen the production skyrocket, but more shockingly the efficiency soar. Bartley saw some time in his two years in Provo, but was constantly buried on the bench by the Cougars’ backcourt. He struggled mightily when he was presented opportunities, shooting 37% from the field. Bartley undoubtedly took advantage of his transfer year, and is now reaping the benefits. Now being given starter’s minutes for the biggest surprise in the Sun Belt, Bartley has seen his 3-point % leap from 31% at BYU to 39% this season, shooting 46% overall and amassing a 115.2 O-Rating. The surprise that is Baylor was touched on previously, and Drew obviously has a lot to do with that. What I have come away most impressed with, however, is Drew’s in-game adjustments that have sparked this undefeated start. In back-to-back games in Atlantis, Baylor faced significant deficits against Michigan State and Louisville, and on both occasions, obviously, stormed back. The Louisville comeback was particularly magnificent. The Bears trailed 32-10 at one point and Louisville pocketed a win probability as high as 98.1%. Drew’s decision to abandon the 2-3 zone and go man left Louisville bewildered en route to a 66-63 stunner. Flip a coin between Mason and Josh Hart. You can’t go wrong. Hart is commanding the nation’s #1 team and having a Buddy Hield-esque senior season, 16th in the country in Individual Offensive Rating (137.8) and shooting 56% from the field. Really too close to call, but I lean towards Mason. He, himself, is 52nd in the nation in O-Rating (130.2) and is shooting 57% from inside the arc, remarkable for a sub-6-foot player. Part of a star-studded recruiting class headlined by Andrew Wiggins, Joel Embiid, and Wayne Selden, Mason is the best collegiate player of the bunch at the end of the day. His bulldog mentality is very indicative of, once again, a very good Kansas team. Hart, also, does not have the cult following in the rap game Mason appears to have. While many prefer Hart at the moment, I’ll go with the Jayhawk, because #BIFM.